After years of planning, preparation, recruitment, and construction, Kwantlen Polytechnic University’s new campus at 3 Civic Plaza is now officially open for business. The campus, which is situated above the building lobby, occupies the first five floors of the 52-storey building and contains classrooms, study spaces, and both assessment and testing services. It also offers space shared between KPU, SFU, and the City of Surrey that will be the base of operations for a new Community Safety Office. The Civic Plaza campus will host classes for post-baccalaureate and graduate diploma programs under the School of Business as well as the Continuing and Professional Studies programs. Classes started at the beginning of January and run from Monday through Saturday. The recently completed 3 Civic Plaza, which is the tallest building south of the Fraser River, is a mixed-use building that towers over Surrey Centre. The five floors that make up the new campus sit underneath several additional floors of condos, and beside a Marriott Autograph Collection Hotel. 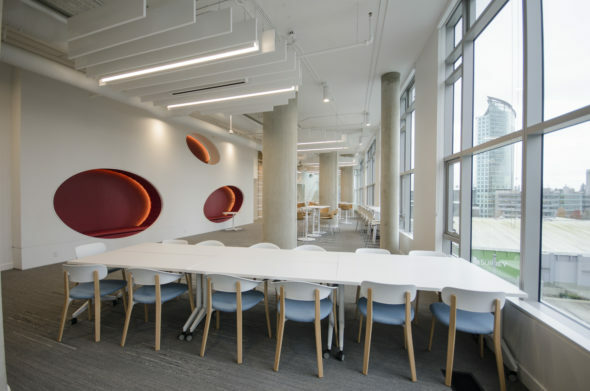 The building was designed with a number of sustainable features in mind, such as hydronic heating and cooling, and using the stack effect of the building to lower its reliance on electric fans for ventilation, which saves energy and money in the long term. 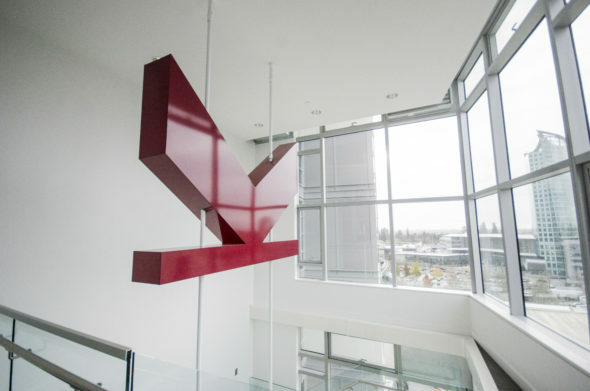 It takes about two minutes to walk from Surrey Central SkyTrain station to the front doors of the building lobby, where KPU students can access the campus via elevator using their student card. Most students will want to check in at the reception desk on the sixth floor to orient themselves before heading to other areas of the campus. “The significance of our presence would be to increase our connection to the community,” he says. The first four floors of the campus have large study spaces on the western side, with the windows offering views over Surrey Civic Plaza. There are six 35-seat classrooms and five 25-seat classrooms mostly organized on the eastern side of the building. A few of them are outfitted with walls that can retract to open up the space, or to make room for hosting events. There are a total of seven meeting rooms which students can book, and the small-sized north-facing balconies reveal an impressive view of the city. A prayer and meditation room can be found on the fifth floor. 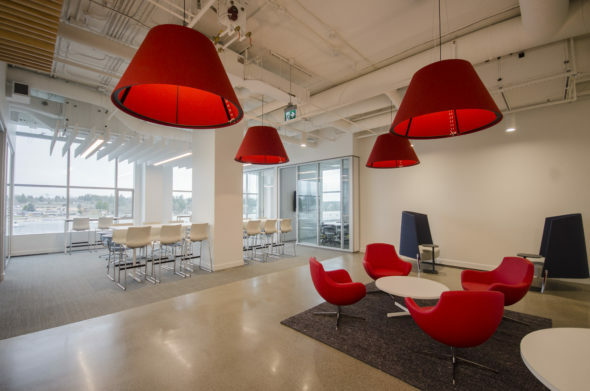 The eighth floor functions as the primary space for Assessment and Testing Services, and also has a broadcast centre room, several classrooms, and an employee lounge. The broadcast room will potentially be used for teaching course modules online, broadcasting to other campuses for collaborative purposes, developing media, or even staging mock interviews. All of the floors are accessible by elevator and are connected by a large staircase on the south end. The ninth floor does not seem to be in use yet, but the plan is for it to be shared by KPU, SFU, and the City of Surrey. The Community Safety Office will occupy part of the floor and potentially serve as a collaborative space for the Mayor’s Task Force on Gang Violence Prevention, which includes research and involvement from KPU instructors. For most staff and students, the beginning of classes in January marked the first time they were able to access the new campus. 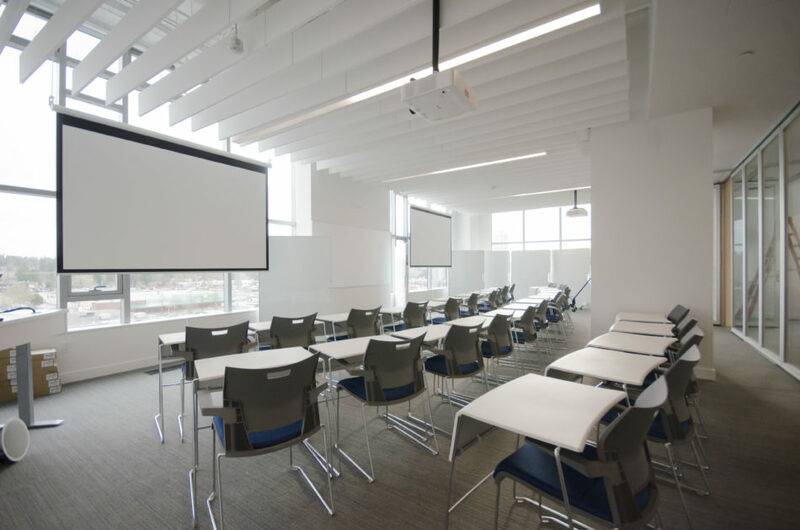 Cesar Castellanos, a business instructor teaching in the new campus, says that the classroom amenities like smart TVs and portable whiteboards will help students as they work through their courses. Students have also voiced appreciation for the Civic Plaza’s proximity to shopping and food amenities, and for being right across from the Surrey Library and City Hall. There is also a Prado cafe in the lobby in front of the elevator up to the campus, and a restaurant in the hotel adjacent to the building. Construction of 3 Civic Plaza began in 2014 and was completed in 2018. The building’s development was overseen by a shared partnership between Surrey City Development Corporation, Century Group, and Delta West Developments in conjunction with ZGF Architects, who designed the building. Originally announced in June 2014, the new KPU campus was “projected to open in early 2016” according to a KPU press release from that time. However, the project faced a number of delays and adjustments were made to the timeline. “When we started, there were some sections of the wall still wide open to the elements, and we were starting to frame without the building fully enclosed, so as the base building was delayed, we were also delayed in getting our work done,” adds Wong. Ferreras also noted that coordinating the construction of the campus with that of the hotel and condos slowed the process down more than was initially expected. 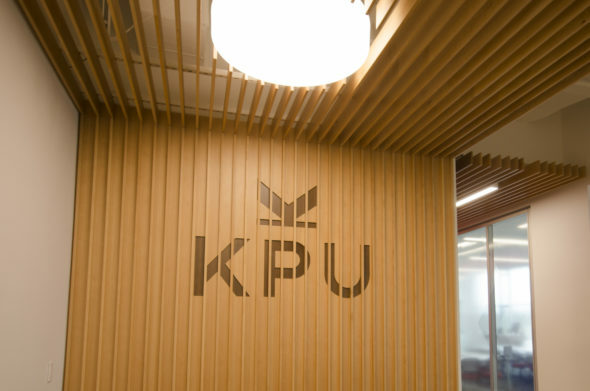 KPU used some of its capital reserves to purchase the space in the building before construction began, and paid for it without outside financial support from the government. The university is responsible for using the revenue generated by the classes, the rental of the top floor, and assessment and testing services to maintain the operation of the campus. 3 Civic Plaza will be the base for a few new programs encompassing a suite of classes that are targeted towards business and continuing education. There are four post-baccalaureate business programs open to students who have attained an undergraduate degree: Operations Supply Chain Management, Professional Accounting Preparation, Technical Management and Services, and Human Resource Management. There are also two graduate diploma programs: Global Business Management and Green Business Management and Sustainability. “Business is now global and no longer just local,” says Ferreras, who adds that both post-graduate programs have seen high enrolment numbers.